Listeners' wits are sure to be tested in this classic "whodunit" from the great detective writer Gaston Leroux. And with the award-winning narrator, Simon Vance, giving his customary suspense-filled performance, the tension is felt as soon as one hits "play". In The Mystery of the Yellow Room, a young journalist and amateur detective, Joseph Rouletabille, attempts to figure out how the daughter of a famous scientist was found severely injured in a room that appears to be locked from within. Leroux's story is one of the first and best examples of the locked room mysteries, and listeners will enjoy attempting to beat young Rouletabille to the solution. 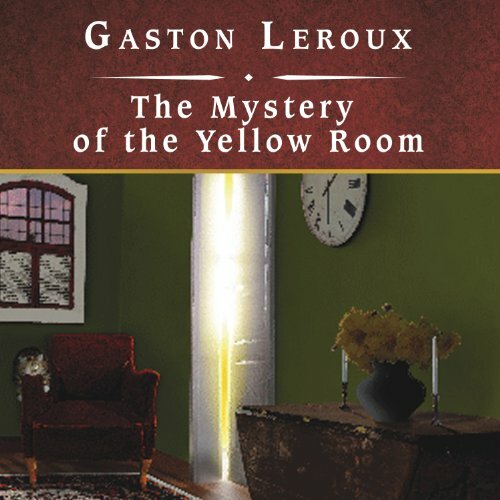 The Mystery of the Yellow Room is Gaston Leroux's masterpiece, and it turned out to be his most successful book during his lifetime. It is one of the classics of early twentieth century detective fiction. At the heart of the novel is this enigma: how could a murder take place inside a locked room that shows no sign of being entered? The novel is also about the rivalry between the detective Frederick Larson and a young investigative journalist, Rouletabille, to solve the case. Larson finds a suspect who is put on trial, only to have him cleared by Rouletabille, who reveals in the most dramatic fashion the identity of the real murderer. This atmospheric thriller is still a favorite of whodunit fans everywhere. If I could change anything it would be the lack of character development. The plot is so involved that the characters are barely fleshed out. The most interesting aspect of the story was the secret of the heroine, Mathilde Stangerson, and why she is shielding the suspect of the crime. The least interesting is all the side stories that they take to get to the end of the mystery. Have you listened to any of Simon Vance’s other performances before? How does this one compare? Simon Vance is always a fabulous narrator and this is right up there with others I have listened to. After listening to the Phantom several times over and loving it, I was really disappointed with this book. Although the mystery is intriguing, there is too much expository narrative. I hung on to the end to the bitter end just to see how it turned out but wasn't impressed. What made the experience of listening to The Mystery of the Yellow Room the most enjoyable? This is a fascinating mystery, with unpredictable twists and turns that you can't see coming. So fun to see something so different from Leroux. The plot is so fascinatingly complex and intricate. As the crime-solving gets more elaborate and Rouletabille gets closer and closer to the killer, the suspense is just incredible. Simon Vance is, as usual, incomparable. With his rich voice, distinctive character voices, and his incredible emotional range, every moment is captivating. I have high expectations for Simon Vance's narratives, and I am never disappointed. One of the few books I could not finish. And since I could not finish it I don't have a lot to say, except that to me, it seems created for the author to pat himself on the head, rather than to entertain.